The Series 7214D Spirahelic® Pressure Gage offers the unique combination of a large analog dial with knife-edge pointerand a 4 ½ digit LCD for increased precision. This 6" gage employs a triple coil spiral/helical wound Bourdon tube to assure quick response and long-lasting service. 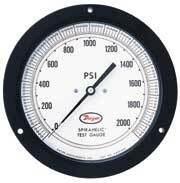 Measure pressures with ASME Grade 3A ( ¼% full scale) accuracy. Design conforms to ASME B40.1 for easy gage replacement in existing panel cutouts. Accuracy:ASME Grade 3A (¼% of full scale). Pressure Connection: Two ¼" NPT(F), field selectable back or bottom connection. ASME Specifications: Conforms to ASME B.40.1. Housing: Black polycarbonate case and clear acyrlic cover. Overpressure: 150% of full scale Normal operation should be between 25% and 75% of full scale.